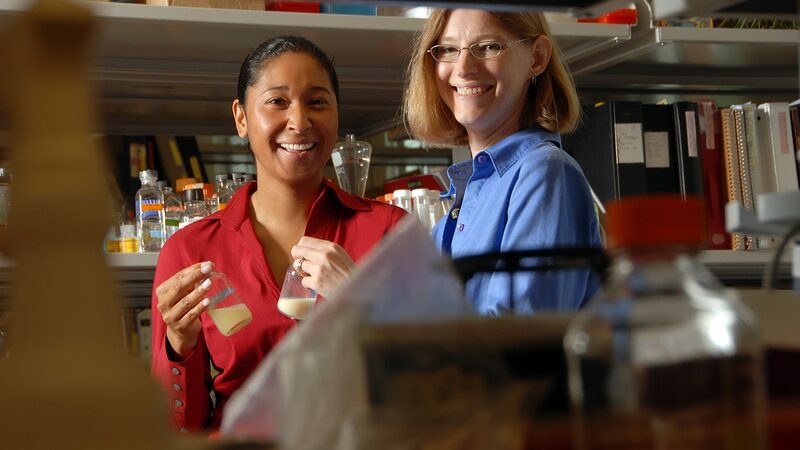 Mari Chinn (left) and Amy Grunden are on the research team investigating the potential of miscanthus as a bioenergy crop. Jeremy Smith, a research assistant in CALS’ Department of Crop and Soil Sciences, harvests miscanthus. 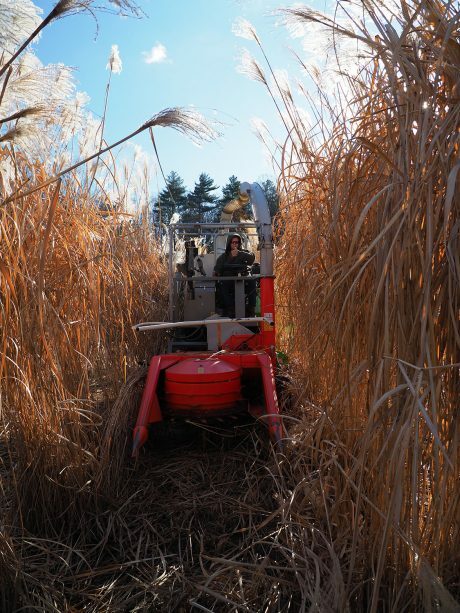 Miscanthus is a high-yield energy crop that resembles bamboo. It grows quickly and produces a crop every year without re-planting. It’s also low-maintenance, easy to grow and typically doesn’t require pesticides or fertilizer after it’s established. Currently, its primary use in North Carolina is for poultry bedding. To the project, NC State’s research team brings several advantages, including Professor Tom Ranney’s breeding program for advanced, high-biomass yielding miscanthus. The team also has experience managing significant acreage of standard commercial lines. The project builds on this experience and examines productivity, environmental sustainability and adaptability of new energy-crop varieties across North Carolina’s mountains, Piedmont and coastal plain. To this point, the project proposes to exploit high-yielding characteristics of new varieties; capture relevant data to address gaps in knowledge about impact for local- and watershed-scale soil and water ecosystems; and generate field data to address barriers in harvest operations, handling and transportation that affect affordability of miscanthus as a feedstock in different regions of the country. Part of sustainability, Chinn said, is looking at microorganisms associated with soils and soil-microbe-plant interactions underground to see if there are specific communities that miscanthus is either drawing in or that are assisting the crop and fixing different nutrient compounds. The researchers are also “heavily instrumenting” with newer fiber optic technologies to measure soil temperature, moisture and other properties to evaluate how the crop affects water movement throughout watersheds, she said. And then there’s the supply chain: “Ultimately, you want to be able to not only grow a crop but deliver it at a cost that’s going to be reasonable for the end-user,” Chinn said. That means reasonable cost for the farmer and includes economics, logistics and composition of the biomass. Harvest and storage strategies, for example, can influence this. 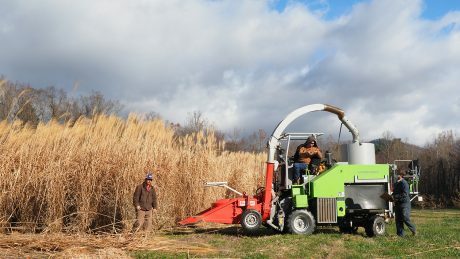 Miscanthus harvest at the Mountain Horticultural Crops Research and Extension Center in Mills River. Pictured (from left) are Stewart Biegler, of the N.C. Department of Agriculture and Consumer Services; Jeremy Smith of NC State’s Crop and Soil Sciences Department; and Nathan Lynch of the Horticultural Science Department. Storage of chopped material brings its own set of questions, from storage performance differences among miscanthus varieties to changes that may affect conversion. That’s where Iogen and Novozymes come in, said Chinn, who is excited about the opportunity for feedback and building stronger relationships with the corporate collaborators. For all the forward-thinking science and technology, the grant is also an opportunity to go back to the future – the entirety of data generated will be added to a public database. 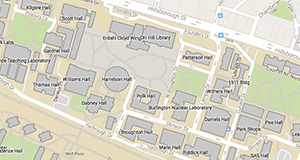 Chinn considers this a return to the university’s public-service roots.